This article is about the NPCs. For information on Necromancy, see Necromancy. For the class, see Necromancer (class). Necromancers are aggressive, spell-casting NPCs. They are always hostile towards the player and will attack you on sight. Necromancers can be found in various forts, caves, and Ayleid ruins, as summarized at Necromancer Dungeons; in addition, they have taken over Cadlew Chapel. All necromancers, including Necromancer Adepts, are Necromancers by class. Standard necromancers are all members of two factions. The basic Necromancers faction ensures that they are allied with the Undead that typically inhabit necromancer dungeons. The Necromancers Cult faction makes them hate Vampires, Liches, and Mages Guild members. Specialized necromancers with different faction memberships are detailed below. Most of the time when you encounter a necromancer, the game only specifies that a randomly determined necromancer-type enemy will appear in that location. Such a necromancer-type enemy has a 50% chance of being an actual necromancer and a 50% chance of being a leveled Undead (the leveled list used in this case will not spawn any full liches, since liches and necromancers hate each other). Necromancer Adepts are the boss-level necromancers, and are only found in dungeons. Twelve dungeons have a single Necromancer Adept, typically as the final enemy you will encounter. One additional dungeon, Moss Rock Cavern, contains two. Five necromancers in Howling Cave who are part of Meridia's quest. These necromancers are members of the basic Necromancers faction, but not the Necromancers Cult faction; they are also members of the Creature faction. Three necromancers outside Silorn during the Ambush quest. They are only members of the Necromancers Cult faction, not the basic Necromancers faction. They do not have the Necromancer birthsign, and therefore have less magicka than most necromancers. Two necromancers in Wellspring Cave during the Mage's Staff quest. They belong to both necromancer factions. They do not have the Necromancer birthsign, and therefore have less magicka than most necromancers. Five Mages in Fort Ontus during the Necromancer's Amulet quest. By class, all five are necromancers (although they do not have the Necromancer birthsign). Initially, they are only members of the Fort Ontus Mage faction and are friendly to the player; after Caranya's death, they join the Necromancers Cult, change into Necromancer's Robes, and become hostile. The Worm Anchorite found at Dark Fissure during the Necromancer's Moon quest is allied with the necromancers, although he is not a member of either faction. † The number of possible potions received changes depending upon your level, as does the quality of the potions. Individual Restore Health potions have a 19-38% chance of appearing; individual Restore Magicka potions have a 38-75% chance of appearing. ‡ Because the five necromancers in Howling Cave are spawned at the start of the game, a leveling quirk causes these NPCs to have unusually large numbers of potions, especially at higher levels. †† If the Spell Tomes official plug-in has been installed, each of these scrolls has a small chance (<10%) of being a leveled spell tome instead of a scroll. Level: This is the NPC's level relative to your character. All items without a percentage next to them are guaranteed to be present on an NPC (although some items, such as potions or poisons could be used before you get a chance to loot them). The quality of the mace or dagger is determined by the Weapons Leveled List; for staves see Generic Staves. Being spell-casters, necromancers have a special "Necromancer Birthsign" that provides +50 Magicka and a 33% resistance to poison. Depending on their race, they can therefore have +50, +100, or +150 maximum magicka. As with Conjurers, Silence spells or a silence-enchanted weapon can be useful to prevent them from casting spells at you. Destruction: 1 Damage Health, Drain Health, Fire Damage, Frost Damage or Shock Damage (the damage spells may all be on touch or on target) and a second, more powerful, one with same effects plus Disintegrate Weapon and Armor. Necromancer's preferences are different from those of Conjurers: they generally use blunt weapons rather than blades and they summon undead rather than Daedra. Also, standard conjurers do not carry scrolls. 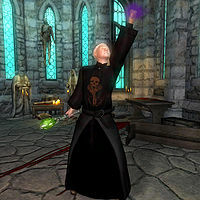 Wearing Necromancer's Robes will provoke negative reactions from Mages Guild members, as detailed at Necromancer's Robes. However, it will not allow you to deceive other necromancers. This page was last modified on 20 May 2018, at 06:38.